That’s why at Mozilla we’re always focused on one question: how do we make Firefox even better and continue to delight users? Because we are different than most tech companies and work in the open, we are sharing some experiments centered around the three focus areas of our strategy. The first focus area is delivering an uncompromised user experience that ensures Firefox meets the most rigorous of quality and performance standards. This commitment is evident in the strides we’re making to improve the richest Web experiences like HTML5 video playback and game performance. We’ll also soon deliver Firefox to new platforms, such as Firefox for iOS and Windows 10, where we will provide an independent and high-performing alternative to the stock browser. Firefox is well known for giving users complete control over their Web experience while pushing the boundaries of the “modern browser.” Today, we’re working with more partners and developers around the world to highlight innovation and offer the best of the Web in Firefox. We showed this with our new search strategy for Firefox to promote choice and innovation and with new open technologies we build based on standards including Firefox Hello, the first WebRTC in-browser video chat tool made in partnership with Telefonica. We continue to pioneer open standards including WebVR, WebGL and WebRTC to advance the Web as the development platform. Earlier this year, we asked users to identify what’s different about Firefox and the results reaffirmed our view that it’s important for Firefox to be increasingly recognized for attributes such as performance, trust and quality that align with our mission. We value that our users trust us because we protect their choices and protect their privacy. 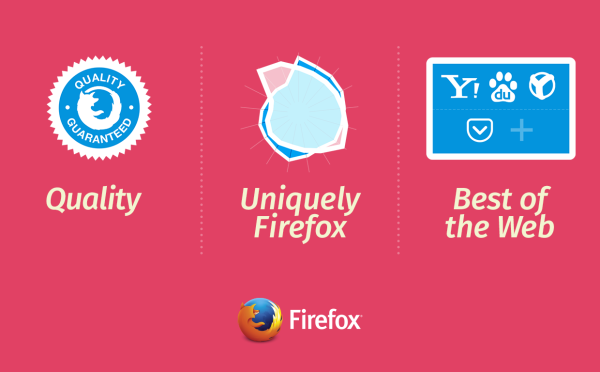 That’s why we are experimenting with improvements to private browsing and other unique features for a major release focused on these three areas that we’ll share with Firefox users later this year.